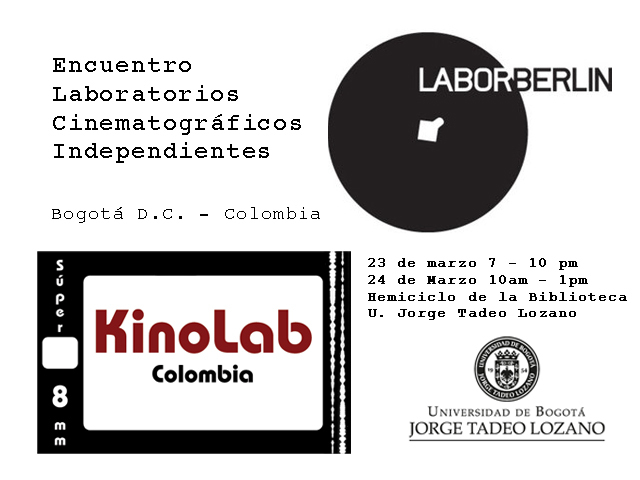 LaborBerlin joins local lab, KinoLab to present two days of talks and screenings in Bogota, Colombia. The event is hosted by the Jorge Tadeo Lozano University. On Friday March 23rd Juan David Gonzalez and Anja Dornieden will present a talk about the independent film lab model and the creative possibilities of working with 16mm and super8. Then they will project a selection of their recent films and of those by members and friends of LaborBerlin. On Saturday Colombian filmmaker Dairo Cervantes will give a talk on the advantage of using super8 to make short fiction films and screen three of his films. Finally there will be a screening of films by film students of the Jorge Tadeo Lozano University.